During planning for the Berri Irrigation Area, land was set aside for establishment of an experimental irrigation farm. During construction of the Berri Irrigation Area, irrigation channels were constructed to this area of land for development of the Berri Experimental Orchard. Planners of the era intended this experimental area should be established to study crops that might be grown in irrigated areas, and examine problems associated with irrigated horticulture. Located five kilometers north east of the town of Berri, the Berri Experimental Orchard (initially called the Berri Experimental Farm) was set up in May 1911. During its initial 6 years of operation, it was administered by the Dept of Irrigation and Reclamation Works (later incorporated into the Lands Department); with the Dept of Agriculture managing the property from 1917 onwards (Mr C.G. Savage was appointed as the first manager at this time). The property consisted of 32 ha of irrigable land and 64 ha of dry land. Most of the focus at Berri Experimental Orchard was on developing production techniques for irrigated tree crops such as citrus, apricots, peaches, prunes, figs, almonds, apples, pears, dried vine fruits, and wine grapes, along with irrigation and drainage studies. The property was also used for assessing and developing new irrigated crops such as Guayule rubber, lucerne, cotton, tobacco, sugar beet, haricot bean, castor oil, flax, hemp, strawberry, tomato, pumpkins, asparagus and other vegetables. It was also used for vegetable seed production during WW2, and growing of fruit trees for the War Service Land Settlement Schemes in the Riverland. During WW2, the Army established a Prisoner of War Internment Camp at Loveday. Horticultural Adviser Mr Cec Grasby was seconded to manage this operation growing vegetables, linseed, guayule for rubber, poppies for opium, peas, lima beans, tomatoes, cotton and carrots. Loxton Research Centre was gradually developed from 1948 onwards. Research activities at the Berri Experimental Orchard were gradually transferred across to Loxton Research Centre, and the Berri Experimental Orchard was closed in 1968. 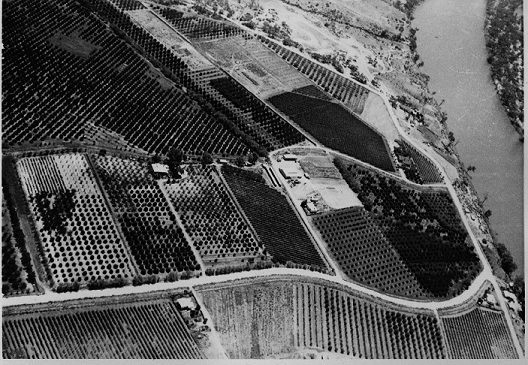 Provides information about the range of trial and survey work being conducted at Berri Experimental Orchard and technical advice for growers in 1948. Contains a detailed map of plantings on the property. Similar information to 1948 field day brochure, but also contains lists of current staff and photographs of the grape drying facilities. Similar to 1952 field day brochure but with additional photos of soil profiles and pests and diseases important at the time. A comprehensive array of information about the Berri Experimental Orchard, its history and activities. Prepared in 1961 to commemorate its 50th anniversary. Personal memoirs of John Steed and his experiences working at Berri Experimental Orchard during 1952-53. The Berri District Office has housed a range of advisory and support staff serving irrigation industries across the Berri, Barmera and other Upper Murray districts. The first Department of Agriculture staff member to be appointed to serve the Berri district was a Mr Vivian Cook. He was appointed as an Inspector of Fruit in October 1914, and operated from a house provided. He had a number of other roles including Inspector and Valuer under Advances to Settlers Act, Lands & Survey Dept, and was also the District Officer for the Irrigation and Reclamation Works Dept. Prior to 1927, there were no dedicated horticultural advisers servicing the River Murray districts. Technical support to local fruit growers was provided by Mr C.G. Savage, Manager of the Berri Experimental Orchard, and other staff from the Dept of Irrigation and Reclamation Works (later to be incorporated into the Lands Dept). From time to time, George Quinn and other horticulture staff from Adelaide would visit the district to run pruning and other training courses. In November 1926, Mr F.R Arndt was appointed as the Horticultural Instructor and Inspector for the Upper Murray (covering Berri, Winkie, Glossop, Lone Gum, Monash, Renmark, Chaffey and Lyrup). At the same time Mr H. Beriman was appointed as the Horticultural Instructor and Inspector for Cadell, Waikerie, Ramco, Holder, Moorook, Kingston, Cobdogla and Nookamka. In 1944, Mr Cec Grasby replaced Mr Arndt, and provided advisory services in the Berri district (residing and operating from the Barmera Hotel during WW2) until he transferred to Loxton in 1951 to provide advisory services in the developing Loxton War Service Land Settlement Scheme. Mr Murray Cooper was then appointed as the Berri and Barmera adviser, (he was previously a Citrus or Red Scale Inspector). These early advisers operated from their homes traveling out to visit most growers on their properties. They normally visited in excess of a thousand growers in a year. In 1966-67, a formal office was established in the town of Berri with the appointment of Mr Greg Botting as district Horticultural Adviser. Mr Tom Simes was also stationed at the Berri Office as a War Service Land Settlement Adviser. Berri was part of a network of district offices serving River Murray irrigation industries, with other offices being located in Waikerie, Loxton and Renmark. It was closed in 1990 with services being transferred to the Loxton office. Prepared by John Steed and Barry Philp, November 2011.